Home / Blog / FAQ: can I get a Saint Francis Way certificate? You can get your passport and certificate from the Saint Francis Walk main office located at the offices of the Rieti Tourist Board on via Cintia 87, Rieti. You must walk at least two days along the Saint Francis Way to apply for the Saint Francis Way Certificate. There is also an ‘Assisiana’ certificate for pilgrims walking 100kms into Assisi; you can claim it at the pilgrims office (Statio Peregrinorum) in Assisi’s Basilica. You can also get a Testimonium of Pilgrimage from the Opera Romana Pellegrinaggi in St Peter’s Square in Rome (you must walk at least the last 100km, from Rieti to Rome); you must walk at least 140kms if you are requesting it from St Peter’s Basilica. Like on the Via Francigena, we recommend you get a pilgrim passport (crecential) before you start your Saint Francis Way trip. It will be useful to track your journey and you will need it in order to apply for your Saint Francis Way certificate at the end of your trip, whether you are finishing in Assisi, Rieti or Rome. It is also a lovely memento of your trip. You can request a pilgrim passport from the Dioceses of Assisi on the Via de Francesco website (in Italian). 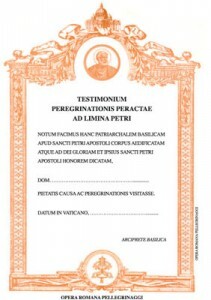 At CaminoWays.com we include our own pilgrim passport as part of our packages; you can stamp it along the way and request the relevant certificates at the end of your walk: Saint Francis Way Certificate in Rieti, Assisiana in Assisi and Testimonium in Rome. For more information about the Saint Francis Way or to book your trip contact our travel experts.